Due To Technical Reasons in WhatsApp, We are not able to send Daily Govt Jobs Alert On WhatsApp. From Now On, The Daily Govt Job Alert Will be sent on Telegram. 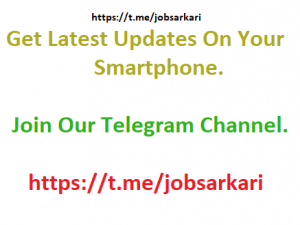 Get Latest Government Job Updates on WhatsApp. Using Your WhatsApp, Send “JOB SARKARI” to 7300-755-733 And Receive Latest Govt Jobs, Results, Admit Cards, Syllabus, Answer Keys & Admissions related Information on Your WhatsApp Daily For FREE. If the Above save does not work, click here to save the number. sorry.sir.abhi.mny 12.ki exam di.hi.par muzy koe experience nahi ahi job ka.myra 12.science hogya pr…. Keep checking 10th pass govt jobs page. Or Defence Jobs section from above menu. mene First Year ki exam di he ..to Aap muje Govt me konsi bhi job mil sakti he kya …..
Aap 12th pass jobs ke liye apply kar sakte hain. Aap 10th pass ya uske below qualification ki jobs me apply kar skte hain. Sir good morning mujay sarkari job chahi aya 10th pass kay bada may konsa konsa sarkari job milayga? Kay app bats sakatay hay? Me aap sabhi ke saath sahanbhuti rakhta hu. Aap apni qualifications ke according hamari site ki “Qualification Wise Jobs” Ki category me jaa kar jo current vacancies chal rahi hai unhe check kar sakte hain. Waha se aap apply bhi kar sakte hain. Aur phir us exam ki taiyari kijiye YouTube or Fee Resources ki madad se agar aap coaching nhi join krna chahte. Agar aap sahi se taiyari karke exam qualify kar lengi to nisaynt rahiye Selected candidates ki list me aapka bhi naam hoga. Hamari site ki qualification wise jobs ki category ko check kijiye. Or waha se apply kijiye job ke liye. Job Sarkari par aapko sirf information he mil sakti hai. Asuvidha ke liye khed hai. Whatsapp ko continue karne me kaafi dikkato ka samana krna pad rha hai. Abhi updates ke baare me koi jankari dena sambhav nhi hai. Ummeed karte hai jald he aapko sahi jankari de sakenge. What document is required to get job of airforce….. Please check the notification on comment on that specific job to know answers of your questions. To get updates on email please subscribe to our email service. Given in Right Sidebar. Check 10th pass category jobs. And apply from there. sir and Medam, i want to government job my calcification 12th pass. please tell me details. Dear sir .my name is Udayan paul. Sir my name ANOOP KANT SAXENA MY Grand father H.S SINGH &Father RAMA KANT SAXENA Both forest Ranger te kiya mujhe uska labh milega my age 43 years h please reply ……..
Sir mera pribar bht grib he..
My name is Kanhaiya sharma. I’m 21 years old. Basically i’m from U.P, currently staying in State of Maharashtra for the Job purpose as well as study also. I’ve completed H.S.E in 2013, after that because of some poor financial problems i did stop my study for one year&decided to go to Mumbai. When i came to mumbai i worked in an international company, and when i collected some money again i took the admission for my further, this way by next year my Graduation will be completed from Mumbai board. I’m experienced around 3 years in an International company as well as domestic with both process, Back-office and voice also. But now i want to make my carrier in government job. I am a 10th pass . but. I don’t how can I do. but I definitely anything do .bas mujhe ek chance chahiye mai apko aisa koi moka nahi dunga ki aap mere liye sarminda ho . mujhe bas chance chahiye . please Call me 8271939117 .ya mujhe gmail kare . Maine up board 12 math se pass ki hai sir is base per koi job aye to sir aaye to plese btayiega. hii sir my self Tanzil zafar. and i am 12th pass . Mai job kr ke badai karta hu. Maine 7 year future group company mai job kiya hai .or abhi mai malas company mai merchandiser hu . Plc sir mujhe govt mai chotasa job dedijiye mai or kuch sikhdikh kr age jana chahta hu . Sir maene 10 k exam deaa h result ayaa nhi to 10 k baad koi job h allahabad Highcourt m 10 pass ki???? Sir Mae 10 exam deea result ayaa nhi to 10 k baad koi joh Allahabad high court m ? I want to join in Indian Navy. can I join in Indian Navy??? I am secured 41%marks in class 12th and 72%marks in class 10th. Hello sir .me Sajina Raijung hun main 12 pass hokar B.A padhai kar rahibhun per bohut job k apply kya bt abhitab koi nokri nahi mile .kya aaplok kuch nokri melenge. This is pooja . I have 2 years of job experience as trainer . I completed my graduation in bcom . I want to try job in postal department otherwise municipal corporation and if other vacancies also their that time also be fine. sir my 12passd hu muje Assam govet men ka koyivi job sahiye me kiya apply korsakti hu.. mera nam Monjit Borah phun no:9859452809. Aap department ki organisation se sampark kariye. Sir main 12th class me 44% marks laya hu.sabhi sub me 40% marks laya hu .please jobsarkari update . sir Mere Ko Job Chahiye Lucknow me 10th Pass ho…? Dear sir me 10 pass hu or mujhe sarkari nokri ki Bahut jarurat h plz Koi bhi job ho mere liye to plz reply me sir..
Kripya aage se apna number site par na daale. Please aage se apne number ko site pr share mat kijiyega. Waise aap jobs ke liye humari site ka latest govt jobs section time to time check kr skti h.
Hamare number par “Job Sarkari” likh kr send kijiye. Hello sir Nmaskar.. I m raj pandey..
Ham is year 12th ka exam denge.. PLEASE LET ME KNOW I NEED A BETTER JOB PLEASE HELP ME. fire and safety ka 1 years ka cors kiya he …..
security ka 3 years ka expirens he …..selari 15000 se aage chahiye …konsabhi kam hoto chalega .. lekin selari 15000 se aage chahiye …. Sir I want govt job please inform mi.my number 7330288169. Hamari whatsapp service me abhi kuch problems aa gyi hain. Hum aapko issi page par aage ke updates dete rahenge. Please send me details of vacancies only in Vidharbha Region . Specially Nagpur. . Bank Job would be more preferable. Thank You. Mob: 8408030279, 9730526342. I have passed 12th in science . But I haven’t experience in job so I can do govt job …. Waise to aapke bhai attend kar sakte hain. Par phir bhi aap ek aap notification ko pad kar he apply kijiyega. Fake service ya vacancies aapko hamari site par kabhi nhi milengi. Agar information ya service authentic source ka hoga. Wahi updates hum site par karte hain. Bhai muje job ki bhaut jarurat hr …meri help karo bhai…. Abhi whatsapp service me thoda problem hai. Agle updates aapko issi page par mil jayenge. Sir call pls 10th pass . My cell no. 09219288860.. .
i am not getting updates . Although request is accepted but i don’t get any updates. There is some issue with whatsapp service. We will keep updating you. Aap Is Link pr Click kr Ke Sbhi 8th Pass Jobs k Liye Apply Kr Sakte Hain..